TROUPERS LIGHT OPERA - FAIRFIELD COUNTY "IT!" Gilbert and Sullivan comic opera Ruddigore in the Norwalk Concert Hall, 125 East Avenue, Norwalk, Connecticut. 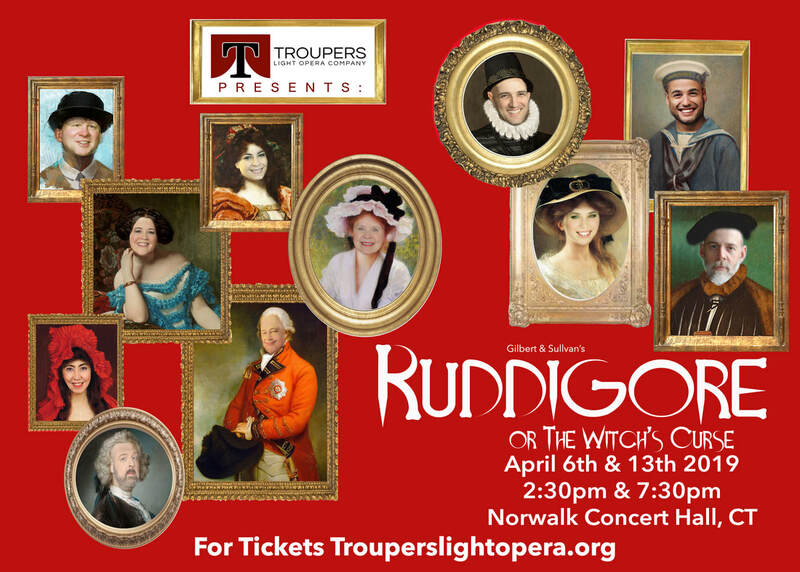 Ruddigore will be fully staged and costumed, with a 23-piece orchestra. For tickets and information visit www.trouperslightopera.org. Ruddigore, Gilbert’s brilliant satire on Victorian melodrama, is accompanied by some of Sullivan’s most memorable and “singable” tunes. Like many other G&S operas it makes fun of Victorian manners, morals, and marriage (along with the British navy) while adding a Gothic twist in the form of wicked noblemen-ghosts who leave their picture frames to haunt the accursed hero. The women’s roles feature a feisty contralto (Dame Hannah), a crazy mezzo-soprano (Mad Margaret), and a ditzy high soprano (Rose Maybud) whose sole guide in life is a book of etiquette. The Troupers cast is thrilled to be performing Ruddigore for its 74th season. Stage Director Kevin Miller makes his second outing with Troupers Light Opera, while Eric Kramer is in his third year as Music Director. The cast, as usual, is drawn from all over Fairfield, Westchester, and New Haven counties.